This three volume reference series provides an authoritative and comprehensive set of volumes collecting together the most influential articles and papers on tourism, heritage and culture. The papers have been selected and introduced by Dallen Timothy, one of the leading international scholars in tourism research. 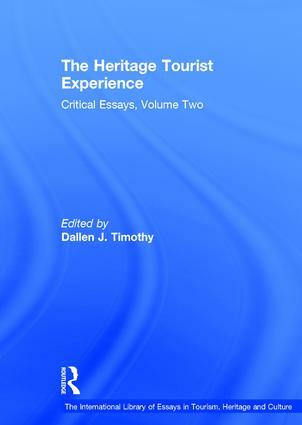 The second volume 'The Heritage Tourist Experience' focuses on the nature of the heritage experience, the demand for heritage, and managing visitors and their experiences. Sold individually and as a set, this series will prove an essential reference work for scholars and students in geography, tourism and heritage studies, cultural studies and beyond. Contents: Introduction; Writing on the Graceland wall: on the importance of authorship in pilgrim landscapes, Derek H. Alderman; Cultural and heritage tourism in Canada: opportunities, principles and challenges, Stephen Boyd; Tourism in Ghana: the representation of slavery and the return of the black diaspora, Edward M. Bruner; Travel motivation of heritage tourists, Joseph S. Chen; Conceptualizing the latent visitor to heritage attractions, Andrea Davies and Richard Prentice; Mines and quarries: industrial heritage tourism, J. Arwel Edwards and Joan Carles Llurdés i Coit; Maori culture and heritage tourism in New Zealand, C. Michael Hall, Ian Mitchell and Ngawini Keelan; Literary places, tourism and the heritage experience, David Herbert; Encounters with Aboriginal sites in metropolitan Sydney: a broadening horizon for cultural tourism?, Melinda Hinkson; Staying away: why people choose not to visit museums, Marilyn G. Hood; Historic houses and special events, Robert L. Janiskee; Industrial heritage: a nexus for sustainable tourism development, Myriam Jansen-Verbeke; Industrial heritage attractions: types and tourists, Deborah Kerstetter, John Confer and Kelly Bricker; Ethnic tourism: a Canadian experience, Yiping Li; Characteristics of the audience for 'events' at a heritage site, Duncan Light; Market-based product development in heritage tourism, Duncan Light and Richard Prentice; The importance of US historic sites as visitor attractions, James C. Makens; Into the tourist's mind: understanding the value of the heritage experience, Alison J. McIntosh; Tourists' appreciation of the Maori culture in New Zealand, Alison J. McIntosh; Attributes of popular cultural attractions in Hong Kong, Bob McKercher, Pamela S.Y. Ho and Hilary du Cros; Visitor experiences at heritage sites: a phenomenological approach, Barbara A. Masberg and Lois H. Silverman; The core of heritage tourism, Yaniv Poria, Richard Butler and David Airey; Benefits received by visitors to heritage sites: a case study of Warkworth Castle, N.A. Powe and K.G. Willis; Visitor learning at a heritage attraction: a case study of Discovery as a media product, Richard Prentice, Sinéad Guerin and Stuart McGugan; Tourism and legends: archaeology of heritage, John G. Robb; Guided by the dark: from thanatopsis to thanatourism, A.V. Seaton; Tourism and tradition: from healing to heritage, Bob Simpson; The cultural values of literary tourism, Shelagh J. Squire; Travelling to the ancestral homelands: the aspirations and experiences of a UK Caribbean community, Marcus L. Stephenson; The varied colors of slave heritage in West Africa: white American stakeholders, Victor B. Teye and Dallen J. Timothy; Museums: a supply-side perspective, Steven Tufts and Simon Milne; Tourism in European heritage cities, Jan van der Borg, Paolo Costa, and Giuseppe Gotti; Name index. Dallen J. Timothy is Professor and Program Director, Tourism Development and Management, School of Community Resources and Development, Arizona State University, USA. He has published extensively on tourism and is Editor-in-Chief of the Journal of Heritage Tourism.